Just a reminder that I'm going to be speaking at the Gallery of Modern Art (GOMA) this Sunday at 1.30pm so if anyone is in the Brisvegas area feel free to come along for a chat! More details here and here. 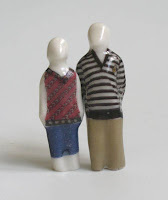 We've also just posted some brand new Little People over at Sandwich Mountain. good luck babe! wish I could be there, i'm sure you'll be smashing!